TMISAT 2016 Application Form: TMISAT Application Form 2016 is available now for all aspirants who wants to appear for the Tolani Martime Institute of Science Aptitude Test 2016. 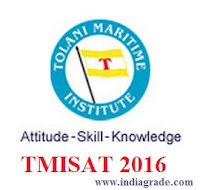 Tolani Maritime Institute (TMI), Pune selection process of students for admission of B.Tech Marine Engineering and Nautical Technology will be based in the applicant's 10+2 Physics, Chemistry & Mathematics (PCM) marks, result of the TMISAT Entrance Exam 2016, performance in an interview and satisfactory medical tests. Candidates have the option of taking either TMISAT 2016 or BITSAT 2016 (BITS Pilani entrance exam 2016). Candidates who are appearing in BITSAT 2016 are exempted from appearing in the online TMI entrance test 2016 and BITSAT 2016 score will be considered. All the complete details regarding the TMISAT 2016 Application Form is available below. So the applicants can easily apply for the TMISAT Exam 2016. Online Test: They should clear Online TMISAT 2016 Test. It consists of multiple choice objective type questions based on Physics, Chemsitry, Mathematics, English, Logic and analytical problem solving. Personal Interview: Candidates should appear for interview to ecliate communication skills, leadership potential, clarity of thought, maturity and reasoning abilities. Medical Examination: Candidate must be in good mental and physical health, so they have to appear for the medical exam as per DGS norms and they should undertake Drugs & HIV tests. 3. Exam Centers: Mumbai, Chennai, Delhi, Dehradun, Chandigarh, Bangalore, Kolkata, Hyderabad, Lucknow, Ranchi and Jaipur. 4. TMISAT 2016 Eligibility Criteria: Applicants passed in the 10+2 exam with Physics, Chemistry and Mathematics as compulsory. NOTE: It must be paid by Credit / Debit Card or Net Banking and Demand Draft (DD drawn in favor of Tolani Maritime Institute payable at Pune). Candidates do the TMISAT 2016 Application Form by two modes, they are Online and Offline mode. User ID and password will be sent to the mobile number. Then you should login into the website by entering the details. Fill the online TMISAT 2016 Application Form without any mistakes. Then payment of the application fees can be done by the Credit / Debit Card or Net Banking and Demand Draft. Finally send the filled in application form to the Tolani Maritime Institute (TMI), Pune. NOTE: Mention Application number and contact details on the backside of the DD. You can get the TMISAT Exam Application Form 2016 from the Axis Bank branches. Then the filled application form along with Demand Draft of Rs.1000/- will be sent to the Tolani Maritime Institute (TMI), Pune. If you still have any questions relating to the admission procedure or if you need additional information, contact the TMI Admissions Office.